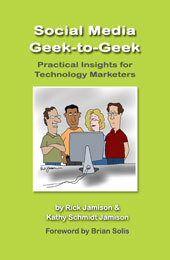 Social Media Geek-to-Geek enables every technology marketer to appreciate the galvanizing capabilities of social media. Geeks tend to be skeptical about social media, especially about its role in anything serious or substantial. Perhaps that is only natural, given that your average geek has fine-tuned analytical abilities and antennae that are always up to detect snake oil. And yet nobody, not even the geekiest geek, can afford to ignore the opportunity and the power that lies in deploying social media for marketing technology, both to geeks and to the rest of the world. Social Media Geek-to-Geek explores the increasingly vital role that social media can play in technology marketing efforts and reveals how you, in a marketing strategy, analysis or implementation role, can harness its energy for your company. Peppered with actionable wisdom from start to finish, this handy title enables every technology marketer to appreciate the galvanizing capabilities of social media, all made possible by geek abilities, intelligence and insight. "Geeks have a unique culture and live by different rules—so, if you want to reach them successfully through social media, you need this book. Rick and Kathy tapped their real-world tested experience to fill this book with advice that you can put to use immediately." "Social Media Geek -to-Geek is a great resource for technologists who use social media to communicate and share real-time information. In our business environment, where transparency and relevancy rules, it's the perfect time to equip geeks alike to join the conversation and have fun!" "We've certainly seen a level of mistrust among the hard-minded business pros—and geeks—who find it hard to believe the hype from all the self-professed social media gurus, ninjas and bandwagoneers. That's why Social Media Geek -to- Geek is so timely. Talking G2G provides a practical roadmap for an audience who is well-equipped to move their interests forward through social marketing. And with this focused approach, the book also enables what we believe to be one of the most important factors in social media success: Make it your own." "A fresh view, based on up-to-date marketing experience, and particularly welcome at a time when the ground rules are changing so quickly."